The we are the leader in custom designed off road parts and are consistently adding new parts to our UTV Line of products. All of our parts are made in the USA by hand with high quality materials to ensure customer satisfaction. Our No Limit Manufactured Parts are hand crafted in California. Our #1 goal is build the best products on the market, 0 exceptions. Our parts are designed to be race ready or for trail/fun run rides. You know you have the very best in aftermarket parts when you have No Limit Manufactured Parts on your vehicle. We use high quality materials and source from the best suppliers. Rods and Links constructed out of Air Craft Aluminum and finished with high quality Heim Joints and custom machined misalignments, Plates and Gussets constructed out of Chromoly. Our owners oversee every step of the process to ensure a great customer experience. There is truly NO LIMIT to what we can do for your UTV! 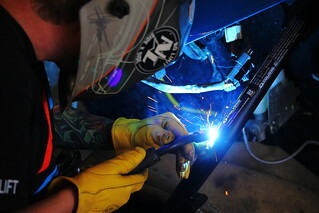 We have the right tools and creative mindset to create virtually any off road part you need. With extensive Solid Works knowledge and precision CnC machines we are able to produce high quality parts to suite your needs. We have integrated seamless business to business tools into our corp website to allow easy access to our product data. This allows our vendors and product dealers to obtain all the current information needed to create a profitable relationship with No Limit Manufacturing.